How Can You Open Wine Without Damaging The Cork? How do you open a bottle of wine? Assuming it’s a cork and not a screw top, there are a myriad of tools to open a bottle of wine and probably twice as many ways to screw up a cork. If it is a screw top and you are still reading expecting to find how to open the bottle, just quit reading, stop drinking wine and stick with Bud Light. If it is a cork, then you’ll need a corkscrew. All cork screws have several parts in common as illustrated below. Most wine has a foil covering the cork. Don’t screw through the foil because you may not be able to see either a badly degraded or dry cork or perhaps a glass stopper or worse, a screw top. 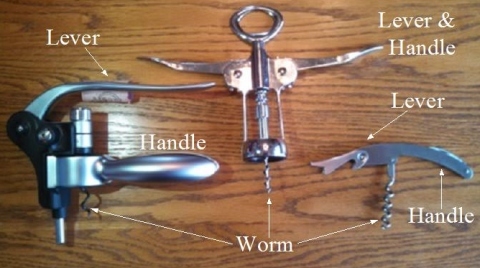 It may be a shock but I’ve seen people not realize that a wine had a screw top and then get frustrated that they couldn’t get the worm to bite. Newsflash…cork screws won’t penetrate a metal or hard plastic screw top so save yourself the embarrassment of trying and failing in front of your friends, which if they are anything like mine, is sure to be accompanied by laughter and pointing. Very few screw caps have foil over them so it should be immediately apparent if it’s a screw top. Assuming that you’ve ascertained that your bottle doesn’t have a screw top, then you probably have to overcome the next obstacle in your path. This is usually a foil or plastic covering over the cork and part of the neck but it can also be a wax seal and just to complicate the matter further, there are two different types of wax seals. We’ll get to them later. Assuming that you have a foil or plastic seal on your bottle, you need to decide if you want to remove it the fastest way or the best way for presentation. If you are looking for a classic presentation, then you only want to remove the top of the foil. This can be tricky and can result in a severe cut if you’re not careful. Remember that the foil does nothing for the taste of the wine so unless you really want that presentation to be perfect, it’s best to just remove the whole thing (sorry wine purists but it really doesn’t matter and you know it). If you are looking for that classic presentation though, the best tool is the classic Waiter’s Corkscrew because they almost all have foil knives on them. Using the knife, cut all the way around the foil using the notch between the neck and the finish (the fat part right at the top of the neck). Angle the knife upwards so that it stays in the notch while you turn the bottle. You will probably need to turn the bottle a couple of times to completely cut through the foil. Remove the top part of the foil once it has been separated from the remaining portion on the neck of the bottle. The fastest way to open a wine bottle is just to remove the entire foil. Insert the point of the worm or a dull knife underneath the bottom of the foil and make a small tear. It’s a simple matter to continue the tear up to the top of the wine bottle until you can remove the entire foil. However, if you really want this professional presentation then only remove the top of the foil. There are two types of wax seals, the plug and dip. The wax plug is just a small layer of wax on top of a cork that has been seated slightly below the top of the bottle. There’s no need to do anything with the wax because the corkscrew will just blow through it like a teenager through a cell phone data plan (if you don’t have a teenager yet, you have something to look forward to…). You just have to hope that the cork is still in good shape because it’s very hard to inspect it. The dipped wax seals are a little more difficult. Some are quite hard. I used to spend a minute or two cursing and fighting with the damn things trying to get enough off to finally get a corkscrew to bite until a winemaker who uses them showed me the trick. Use your hand and rotate the top of the bottle against your palm for 30 – 40 seconds or so. You don’t need to do it too quickly but you are looking for the friction to warm and soften the wax. Once it’s softened, you should be able to use the knife portion of the opener and scrape away the top portion sufficiently to get the worm to bite. I know you want to jump to the satisfying “POP” of the wine cork being removed from the bottle…but wait…you need to check the cork first, particularly if the bottle is an older bottle or was not stored properly. If the wine cork looks dry or when you start to work the worm into the bottle, it just fragments or the worm is pulling out of the cork when you try to open it, stop immediately. 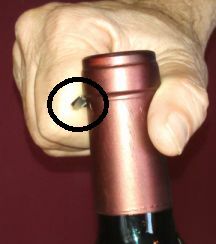 The cork has been damaged and likely will not be able to be removed by any corkscrew that uses a worm. Part 2 of this post shows how to remove damaged corks. Assuming the cork is in good shape, it’s time to use the corkscrew. There are two keys to doing this. 1) Make sure that you are applying enough pressure to the top of the worm so that it actually drills smoothly into the cork. If you apply only light pressure, it will act like an auger and just drill a hole. You should see the worm continue to enter the cork as you turn the corkscrew. If it doesn’t, all you are doing in drilling a hole. 2) Make sure that the worm enters the cork at a straight angle and when you lever it up, it needs to be pried straight up as well. I’ve seen many a waiter insert the corkscrew and then pry the cork up at an angle snapping the cork off in the bottle. If you still have half of a cork in the bottle you could still use a corkscrew, although the best tool is now a pronged wine opener, commonly called an Ah-so. Check out part 2 of this post to see how to properly use this. Assuming everything worked well and you have successfully opened your wine bottle quit reading and enjoy your wine! 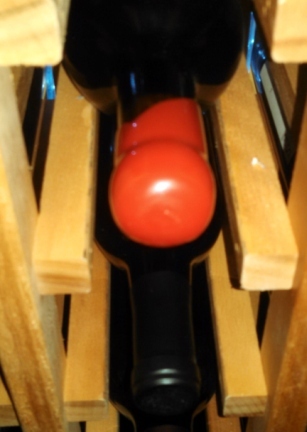 If you have not properly opened the wine bottle, check out section 2, removing problem corks. Wish I wouldve read this article before I went out and bought my $9,000 chainsaw. I wish I could afford a $9,000 chainsaw!